MIS presents the David Bowie exhibition , organized by the London Victoria and Albert Museum (V & A). V & A, one of the most important museums in the world in design, had unprecedented access to The David Bowie Archive to create this exhibition. In addition to set lists, song lyrics, manuscripts, instruments and drawings, the Brazilian show includes 47 costumes, movie clips and live shows, video clips and photographs. 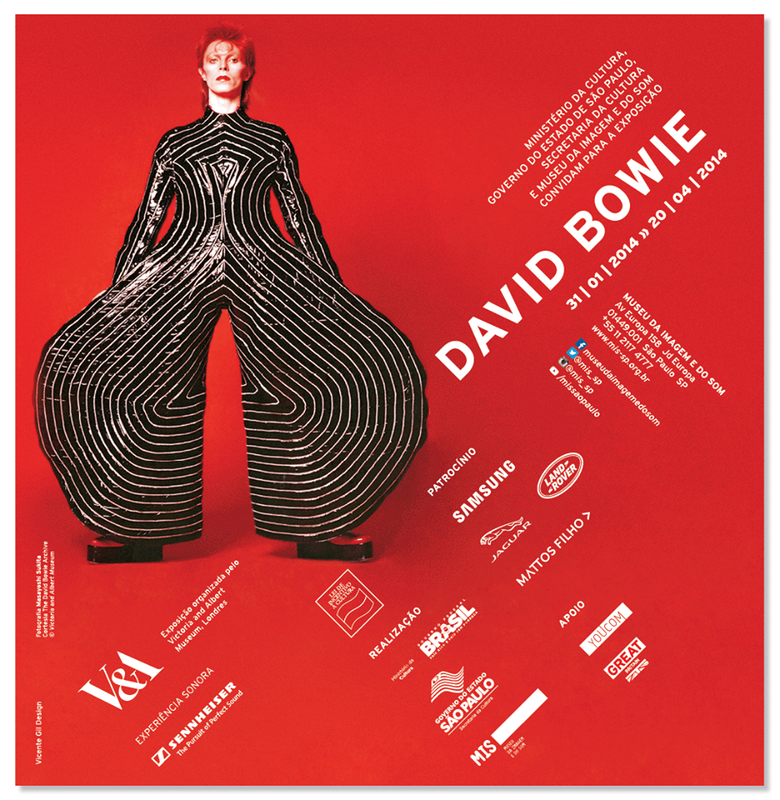 Organized thematically, it takes visitors on a journey through countless Bowie characters and legendary performances, highlighting their artistic influences and their experiences with Surrealism, German Expressionism, Mimics and Kabuki Theater. Among the costumes that compose the show’s inventory are pieces from the Aladdin Sane album, such as the asymmetric vinyl-made jumpsuit (Tokyo Pop) signed by Kansai Yamamoto and the red platform boot, both used on the album’s tour in 1973; the light blue suit used in short recording made for Life on Mars? and Freddie Burretti’s set of trousers and multicolored jackets, made for the Ziggy Stardust tour. Photographic production also brings interesting material, such as the promotional photo made for The Kon-rads, when Bowie was only 16; a collage made by Bowie from stills of The Man Who Fell to Earth video; and another image of him with the writer William Burroughs, photographed by Terry O’Neill, and manually colored by the singer. The exhibition puts visitors in the creative process of Bowie and shows how his work influenced several artistic movements. She presents the artist as an astute observer of our society, who has always made significant interventions in the culture, leaving a powerful legacy. MIS is co-editor of the book David Bowie , published by the publisher Cosac Naify. The publication is a translation of the original book by V & A, on the occasion of the exhibition in London. The book traces the artist’s career from his youth in the suburbs of London, his influences and decisions, discoveries during the recording of the first albums, to become a world-renowned figure whose work has a strong impact on music and avant-garde art. century. This is the first book produced with unrestricted access to The David Bowie Archive , Bowie’s personal archive with original lyrics, costume outfits, materials, pictures and objects. Texts from the curators of the Victoria and Albert Museum about Bowie’s influence in the fashion world, as well as essays on music, film, gender, among others, complete the issue. Born David Robert Jones at Brixton in South London on January 8, 1947. His career in music has lasted almost 50 years and Bowie can boast of his commercial success and expert criticism. He is recognized for being one of the most audacious, influential and creative artists of his time. Author and interpreter of hits like ‘Let’s Dance’, ‘Life on Mars?’ and “Heroes,” sold more than 140 million albums. It has been awarded several times, including two Grammys, two British Awards, three MTV Video Music Awards and one Emmy. In the cinema, he participated in films that until today are icons of the pop culture, like the man who fell in the Earth (1976), I, Christiane F., 13 years Drugged and Prostituted (1981) and Labyrinth, The Magic of the Time (1986) . In 2013 he surprised audiences with the release of the album The Next Day, the first work after a 10-year hiatus. R $ 10 (whole) and R $ 5 (half) for sale only at the MIS Reception.